Unique opportunity to acquire a newly built 129 m² penthouse with its own private roof terrace in Illetes with stunning sea views over Palma Bay and the Mediterranean Sea. The apartment is located at the top of the property on nine floors with completely private position. The apartment has a terrace of approximately 35 m² situated next to the large living room as well as a completely private roof terrace of about 150 m² . The accommodation is divided between spacious living room and open-plan kitchen with exit to the terrace. Three bedrooms and three bathrooms, of which Master bedroom has a bathroom en suite and also exit to the terrace. 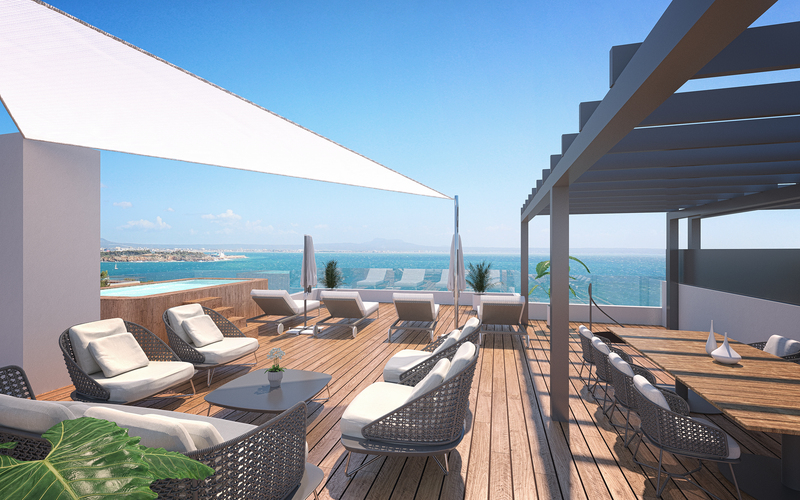 Both terraces have panoramic views of almost all of the Palma Bay. There are plenty of space for both dining and lounge furniture, as well as sun loungers. The larger roof terrace also has a pergola for the necessary shade during the summer months and a jacuzzi for cooling baths for long and beautiful days in Mallorca's amazing climate. The aprtment is now under construction and occupancy is expected to take place in December 2019. The floor is characterized by consistently high standards with stylish and tasteful materials. Large open spaces with a lot of natural light where the sea and the sky are constantly present. Close to the beaches of Illetes and to Purobeach Illetes. You can reach Palma quickly by taxi, car or bus. Garage space can be arranged if desired.